A Pius Geek: Interview with author Karina Fabian on "Live and Let Fly." Interview with author Karina Fabian on "Live and Let Fly." We've had a few interviews with Karina Fabian before. She's appeared as a guest blogger once or twice. She's tolerated interviews from here for at least two of her books -- ISIG II, and Mind Over Mind. And, now, we're on her novel Live and Let Fly. What I'm going to do is simple. This interview will not appear on the blog, but on my Examiner.com page. Since the word count on the articles is supposed to cap at only about 500 words, it's been broken up into a four part article. I asked how she came up with a dragon and a magic-wielding nun as a heroic duo. And part four was on being Catholic and writing this book. However, I'm not going to let you, loyal reader, and newcomer, leave here empty handed. No. For coming here today, I'm giving you excerpts from the novel. 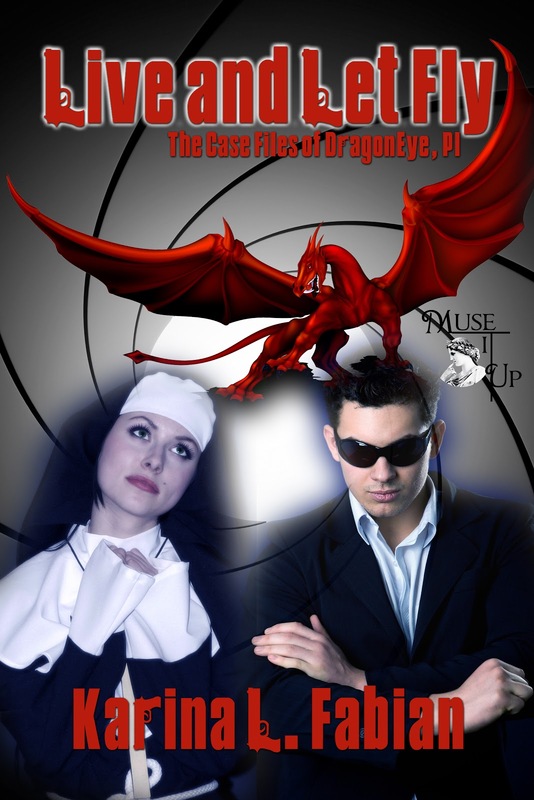 No human spy, however, ever went up against a Norse goddess determined to exploit those secrets to rescue her husband. Sigyn will move heaven and earth to get Loki—and use the best and worst of our world against anyone who tries to stop her. And now, some snippets, and extra data. Festival was Friday. We had two days to stop a Nordic demigod evil overlord—overlady, overbeing, whatever—from blowing up a nuclear power plant, possibly destroying half an island full of revelers in the process, and creating an Interdimensional Gap through which she can bring the rest of her giant relatives to set up housekeeping where the Faerie Catholic Church didn't have the power to control them. In other words, two days until Hel broke loose. I've had worse deadlines. I could afford a long bath in our whirlpool tub and a good meal first. Charlie crouched down by Stutterboy and glanced at his nametag. "Look, Philip, we're in a bit of a hurry. We know Rhoda Dakota's being held captive somewhere nearby. Now you can be a good survivor and tell us where…or you can be dinner." Thanks for hosting me here and on examiner.com. I'm enjoying seeing the quotes you pick up to post on FB, too. I'm going to add them to the tweet list I'm making.